The Conservatives lose their lead, dropping two points to 40%. This puts them level with Labour, who stay on 40%. Jeremy Corbyn has seen his net approval rating decline noticeably from -10% last month to -19% this month. However, Theresa May’s net rating has remained relatively stable, very slightly improving from -9% to -8% this month. Theresa May’s lead over Jeremy Corbyn on who would make the best prime minister has risen from 8 points to 12 points (currently it stands at 36% for May vs 24% for Jeremy Corbyn). Theresa May has seen a noticeable increase in the number of those who think she is decisive, up from 32% last month to 41% this month, giving her a sizeable lead over Jeremy Corbyn on this. 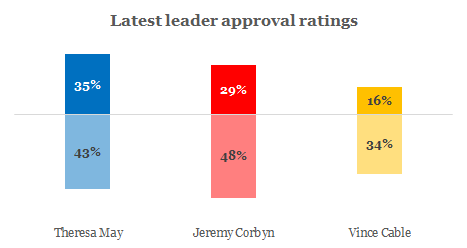 On the other hand Jeremy Corbyn has seen a decrease in the proportion who think he is a strong leader, down from 32% to 27%. Half (50%) approve of the way Theresa May has responded to the Salisbury attack, up from 41% last month.